Properties in Cérences average 4.6 out of 5 stars. A charming house with garden in GRANVILLE! Property 5: A charming house with garden in GRANVILLE! between Granville and Bréhal, holiday Oil Mill in Hudimesnil. Property 12: between Granville and Bréhal, holiday Oil Mill in Hudimesnil. House seaside 250 m from the beach of Jullouville, ideal family. Property 13: House seaside 250 m from the beach of Jullouville, ideal family. Nice and bright house with south facing garden, 500metres from the sea. Property 15: Nice and bright house with south facing garden, 500metres from the sea. LIGHT, SPACIOUS AND COMFORTABLE HOUSE WITH BIG CLOSED GARDEN WITH WIFI. Property 20: LIGHT, SPACIOUS AND COMFORTABLE HOUSE WITH BIG CLOSED GARDEN WITH WIFI. HOUSE 20 METERS FROM THE SEA, 2nd LINE, COMFORTABLE WITH CLOSED GARDEN / WIFI. Property 22: HOUSE 20 METERS FROM THE SEA, 2nd LINE, COMFORTABLE WITH CLOSED GARDEN / WIFI. Country cottage of 6 pers. in Normandy between hedgerow, sea and beach near Granville. 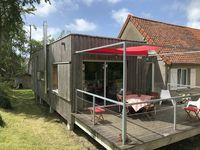 Property 40: Country cottage of 6 pers. in Normandy between hedgerow, sea and beach near Granville. Private pool, quiet location, near beaches ... Indulge ! Property 49: Private pool, quiet location, near beaches ... Indulge ! Mansion - Lingville House with character, with big garden, 5minutes to the sea . Property 50: Mansion - Lingville House with character, with big garden, 5minutes to the sea . The house is settled in a quiet neighborhood but close enough to the beach and shops. The home is comfortable with great living space. Very well appointed kitchen, super deck in the back of the house. Parking in the yard is so convenient. Bedrooms on the small side but adequate with very comfortable beds. Could use one full length mirror somewhere in the house. Bathroom is of good size, great shower; just the mirror above the sink is too far recessed and not convenient to use. Overall, loved the house great living volumes, we would book it again. We loved every minute of our two weeks at Helene's house overlooking the Donville-les-Bains beach and dream of returning in a few years. The terrace is heavenly with room for up to six people to eat outside (we ate every meal outside for two weeks). The ocean air fills the house which is on a very quiet street, almost no cars went by. The back garden is charming too. The house is well-equipped and the beds very comfortable. Being able to walk the few minutes down to the glorious beach (with such delicious water for swimming) or into Granville for dinner and shopping, or to the Granville tennis club which gives onto the Christian Dior Museum gardens was marvelous. We didn't need a car the whole two weeks as you can also walk to the shops. Haven't slept so well in years. The best vacation we have ever taken. Thank you Helene.